Notes: Carrying strap for SL-10/SL-11 recorder. Notes: The Rycote 046 001 Portable Audio Recorder Kit is a suspension, windshield and grip system for the Zoom H4N portable recorder. With the huge leaps in functionality now offered by portable digital recorders their use in sound capture has become increasingly critical especially on HDSLR based productions. Rycote have tailored a solution for the Zoom H4N that successfully addresses the inherent handling, vibration and wind noise issues that can affect a recording. Utilising Rycote's patented Lyre technology the suspension has been specifically devised to accommodate the Zoom H4N by attaching to the 1/4" female thread on the underside of the recorder. In conjunction with the included Rycote 1/4" to 3/8" Swivel Adaptor (047 307) the suspended recorder can be mounted on a boom pole, microphone stand, camera hot shoe or hand held by using the soft-grip Extension Handle supplied as part of the kit (037 301). The orientation can be adjusted 180 degree enabling the recorder's microphones to be pointed directly at the sound source. 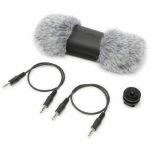 For wind noise suppression the kit includes the Zoom H4N variant of the Rycote Mini Windjammer (055 374). The Rycote 046 001 Portable Audio Recorder Kit is a suspension, windshield and grip system for the Zoom H4N portable recorder. With the huge leaps in functionality now offered by portable digital recorders their use in sound capture has become increasingly critical especially on HDSLR based productions. Rycote have tailored a solution for the Zoom H4N that successfully addresses the inherent handling, vibration and wind noise issues that can affect a recording. Notes: This Rycote hot shoe extension bar allows you to attach multiple accessories, such as lights and mics to the single hot shoe on your camera or camcorder. Bar length is 20cm (approx 8"). The extension bar can rotate 360 degrees around the shoe fixture so accessories can be moved out of view or balanced correctly. Weighs just 50g. Notes: The Tascam AK-DR70C is an accessory pack for use with the DR-70D DSLR companion portable audio recorder from Tascam. The kit is comprised of a shoe mount adaptor, a fur windshield and a pair of 3.5mm stereo mini jack cables. Tascam DR-10C option kit for Shure microphones. Notes: The RC-10 remote control for DR-40 and DR-100mkII from Tascam is a compact wireless/wired remote that allows you to control the functions of the DR-40 or DR-100mkII handheld digital audio recorders. Notes: The RC-3F is a 3-way footswitch for the GB-10, LR-10, DP-03 and other TASCAM recorders and players. The 2.5mm mini jack plugs into the "remote" jack of these TASCAM products to add features like play/pause, looping or punch in. See the product's user manual for details. Notes: WS-11 windscreen uses artificial fur to block even the highest wind gusts from the internal mics of TASCAM recorders. The windscreen works in both XY and AB position. Notes: With the HS-1, you can attach your Handy Recorder to any DSLR video camera equipped with a standard Hot Shoe mount. Now you can have both your video and audio controls right at your fingertips, and your microphone right at the action.